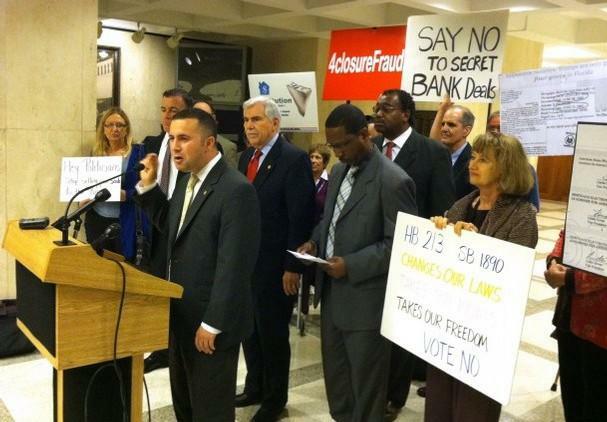 Darren Soto, D-Orlando, told a group of protesters from across the state that he believed their presence was the reason Naples Rep. Kathleen Passidomo’s foreclosure bill did not reach a committee agenda Thursday. Someone erected an Occupy tent on the fourth floor of the Florida Capitol during a protest of Naples Rep. Kathleen Passidomo’s bill to speed up the foreclosure process. TALLAHASSEE — A few dozen hundred Floridians from around the state converged in the Capitol Thursday for one reason: homeowner rights. All of them were angry about House Bill 213, which they say weakens the rights of foreclosure defendants. The bill is sponsored by Rep. Kathleen Passidomo, R-Naples, and Rep. Greg Steube, R-Sarasota. Two bus loads of protesters brought signs and left them leaning against a wall outside the room where the House Judiciary Committee discussed other bills — but not HB 213, something Rep. Darren Soto, D-Orlando, said was the result of public outcry. “It is my belief that heavy pressure from the public has caused this bill to go back to the drawing board,” Soto told reporters following a press conference he held in opposition to the bill. Passidomo refuted that claim, saying “it’s absolutely and utterly wrong.” The legislation did not reach the committee, she said, because negotiations over the Senate companion bill’s language were incomplete. “I’ve been taking comments since August and making changes,” Passidomo said. Passidomo’s legislation seeks to hasten stalled foreclosure proceedings, which she says are clogging court dockets and preventing those houses from again reaching the market. Foreclosures in Florida take 676 days, more than twice the national average, legislative staff reported. The bill would streamline the process, reducing the number of judicial hearings from two to one. It also allows any lien holder to request that a judge order a homeowner to rebut a foreclosure action. The judge may review the request in his or her chamber without a hearing. These protesters are Patriots. Why would anyone want to help the banks out any more. Like they really need the help. they have received our tax dollars and have the upper hand already in the foreclosure process. very few homes actually go free and clear to the debtor. In some cases yes and that because the banks commit FRAUD and deserve to loose. In most the homes either get sold in short sale or get worked out in Bankruptcy which have federal judges that FOLLOW the law. Sate judges are mostly a bunch lazy bank lovers who give a the banks summary judgement even if the banks commit fraud. Passidomo is an evil witch! She is probably this way because she is so ugly. I mean this lady is UGLY! To bad her soul is rotten too. She needs to stop tossing the salads of the BANKSTERS and get the heck out of office. The priority is NOT GETTING HO– USES ON THE MARKET . . . that’s the least of anyone’s concerns – the priority SHOULD BE KEEPING HUMANS SAFE AND SOUND IN THEIR HOMES – the whole market place bit should never be a dominant issue of this debate – who cares whether someone with security and money already doesn’t make a few more millions until next year – that is not the priority in this mess and it is resented that these articles are regards by politicians and reporters is ‘to help out the market’ – the market got us into this mess in the first place – change the dialogue – to help the homeowners stay in their homes – that is the question and the apex of the issue – CHANGE THE DIALOGUE AND PRIORITY POLITICIANS – People First; Markets Later – much later. The perspective of these idiots like Passidomo is so skewed how did she get to represent people of Florida in the first place? ?